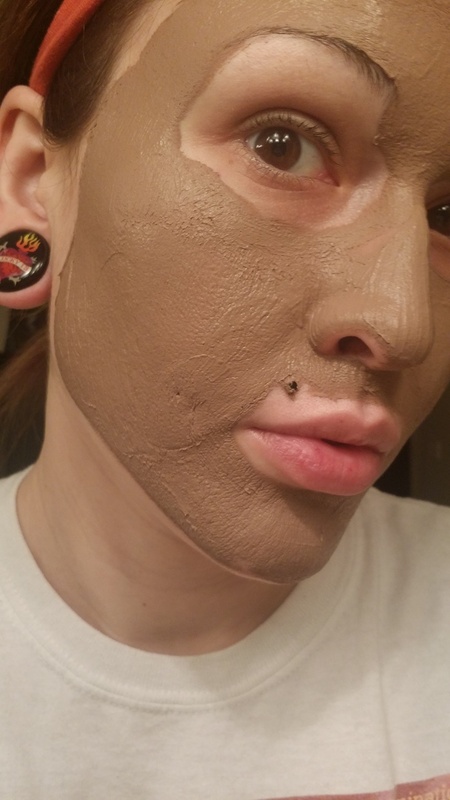 We all know I’m a sucker for skincare, so today I’ll be doing a review on Pür Minerals Dirty Girl Detoxifying Mud Masque. Pür Minerals is a 100% cruelty-free brand that I’ve been interested in for a while, but haven’t had the chance to try until recently. I have a monthly Birchbox subscription, and they have a points system that’s really cool! Every sample that you receive in your box, you can review, and each review gets you 10 Birchbox points. Every 100 points is $10.00 to use in their shop! I personally think this is amazing. I had accumulated $20.00 worth of Birchbox points and wavered between purchasing my beloved GlamGlow for $20.00 less than normal, or trying something new. I went with something new. Pascalite Clay was first discovered in Wyoming in the 1930s. Also known as Calcium Bentonite, this white clay has a very fascinating, unique ability. It produces an “electrical charge” when hydrated. When Pascalite Clay is introduced to fluids, the electrical composition changes, allowing it to absorb toxins by essentially sucking out the hydrogen from where it is applied, and replacing the area with oxygen. Bentonite is known for its ability to absorb and remove toxins, heavy metals, impurities, and chemicals. * Calcium Bentonite can be ingested to help with GI issues, mixed with other herbs to create mud packs (or masques! ), used in a bath for soothing, oral health care and it helps to speed healing of rashes, burns and minor skin irritation. Cucumber Extract,while not quite as X-Men-esque as Pascalite Clay, has a number of benefits as well! There is research into cucumber extract and its ability to help fade skin discoloration. It’s also very soothing on puffy eyes, or when your skin is irritated or red. Cucumbers contain antioxidants which block the effects of free radicals, and can help prevent aging. Salicylic Acid has a gentle exfoliating effect, softening the skin and allowing dead skin and buildup to be washed away easily. Derived from the bark of the willow tree, it has been used widely in skincare in years past. There is historical information dating back to the mid-1700s regarding its ability to calm fever. It was used often by Native Americans as a medicinal plant, used for pain relief and reduction of inflammation. In the early 1800s, an Italian chemist was able to convert an extract of the bark into a sugar, and further oxidize the extract into becoming what we know today as Salicylic Acid. Okay, so I was already pretty freaking intrigued by the things I learned, but I do love delving deep into the science behind my skincare. I was pretty much sold on the ingredients in the masque, and I have wanted to try the brand for a while, so I ordered it and got ready to try something new and exciting! It was on my mind all week! Birchbox was really fast with delivery. I got UPS Ground shipping, and it was delivered on a Friday, and I had ordered it on a Wednesday. The box was too cute. It has a white background with pale sea foam green and silver accents. The name of the brand is in a deep blue metallic print, and the sides of the box are robin’s egg blue and have the ingredients in the masque and the ingredients Pür never uses in their formulas. The back of the box is white and has the action, usage and key ingredients. And we’ve already been through the ingredients. The bottle is very similar to the box. It’s a 4oz tube of product, with a small hole opening. The lid screws on/off and is silver, with Pür printed on the bottom. Okay, now into actually using the product! The masque is very thick, but it doesn’t feel heavy. It’s a pale brown color, and the consistency reminds me of chocolate frosting. The product has the faintest hint of fragrance, which, to me, smells of old-fashioned laundry soap. Very light and pleasing, and it doesn’t linger at all. I like that the scent comes from natural ingredients, versus a chemical fragrance. The masque contains lavender, rosemary and sandalwood extract. When I first receive any kind of skincare product, I like to do a patch test before testing on my face. I use either the inside of my elbow or the back of my hand, depending on the product. The photographs above are me doing the patch test, but also to show you the consistency of the product as best I could. It has a very creamy spread, and feels quite cool on the skin. After my test, I didn’t have any noticeable reactions, so it was on to face application! 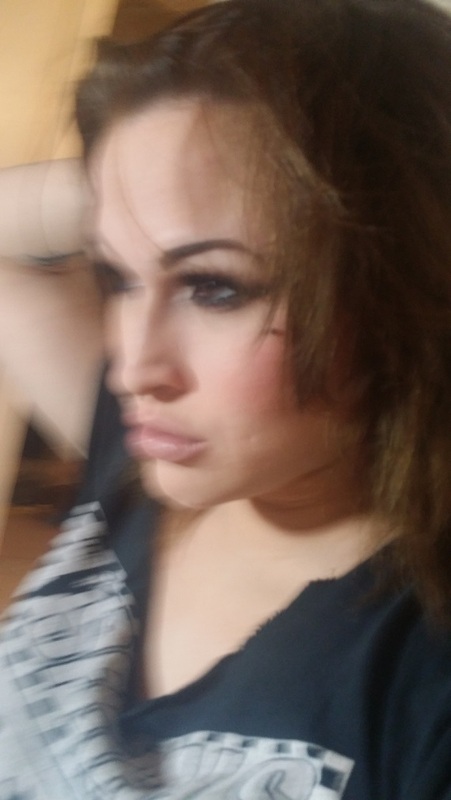 I applied the product using a foundation brush that I have set aside for all of my masqueing needs, and it went on smoothly and evenly. 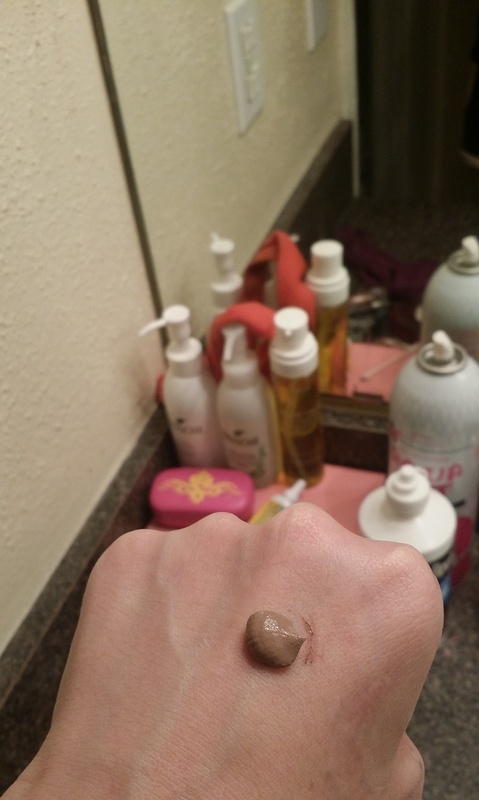 It took very little product to cover my whole face, and I think this bottle will end up lasting me a long time. The scent was so faint that I only caught hints of it here and there throughout the whole process. I love it. The instructions direct you to leave the masque on for 5-20 minutes, and I do love pushing things to the limit, so I left it on for the full 20. After about five minutes, I could feel my skin starting to tighten a little bit. It felt similar to other clay-based masques I’ve used, but without the intensity. It was quite pleasant, actually. I didn’t feel like if I smiled, my face would shatter, but I could definitely feel it as it dried. At around the 10 minute mark, my skin also began tingling very lightly. I like that while this dries quickly, it doesn’t flake off while it’s drying. Some masques have a terrible tendency to shed bits of gross masque gunk, which is just…just yuck. No. I don’t like that one bit. And this got very dry before the end. Here is my masque on at the 20 minute mark. You can see where it is drying and peeling slightly away from my skin. Even at this point, the masque never left my face, it just peeled up and stayed together. It was definitely tight at this point, and I think I’d wash it off after 15 minutes in the future. When it came to rinsing my face, I first used my tried and true method of just lightly running a damp, warm washcloth over my skin and letting the water do the work. Well, this did not work. This thing was so super stuck to my face that water didn’t make it budge at all. So then I rolled up my sleeves and…took some Maracuja Oil and dabbed it lightly over my whole face. The washcloth then took care of the masque with zero problem. Rinsed right off. Texture: 10/10 – Okay, this stuff totally reminds me of chocolate frosting, and you just can’t go wrong there. If they made this stuff but incorporated cocoa powder? Pssh, they’d make a kabillion dollars. Okay, that wasn’t a very professional opinion, so let’s try again. Being so creamy and thick while still being so fluffy is not an easy feat to achieve. It doesn’t take much to spread a generous layer across your entire face. Very smooth and feels soft and almost whipped. I think this would be best applied with a brush, as it tends to stick to the fingers and could potentially waste product. Fragrance: 10/10 – This straight up reminds me of my laundry room when I was a kid. Little wisps of soap-flake scented memories swirled around me while I wore this. I easily could have drifted off to sleep with that relaxing fragrance enveloping me. Call me nostalgic, but I’ve never smelled anything that was so reminiscent of my childhood before. Application: 9/10 – As I mentioned above with texture, this does need to be applied with a brush or spatula instead of your fingers. It sticks to and soaks into everything it touches. It’s difficult to clean out of washcloths, and it smears easily on sinks or clothing. This is mud, guys. Treat it like mud. Don’t fling it. 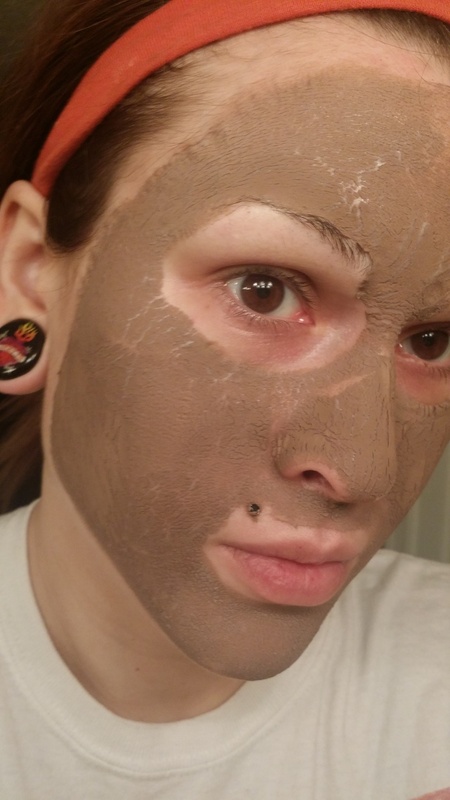 Results: 7/10 – Rinsing off the masque was a little bit more intensive than I would have hoped for, and if you don’t have an oil that you can use to remove your masques, you may want to steer clear. Otherwise, you’ll end up rubbing your skin raw to get it off, and that’s just going to defeat the purpose. Immediately after using the masque, my skin felt fresh and quite clean. I didn’t notice any spectacular results right away, but I did see that after applying makeup, running errands all day, sweating, cleaning and so on, my skin stayed oil-free and glowing. After I rinsed my makeup off at the end of my day, I didn’t feel quite as greasy and dirty as I normally would when I do so much stuff in the Florida sun. If you’re expecting a miracle, this may not be your product. But I think for oil control and to help balance out your skin, this would be an excellent, low-cost product to add to your weekly regimen. I like most everything about it so far, and I’m really looking forward to seeing the results moving forward! I hope you all liked this post and learned something fun and exciting. Let me know in the comments below what you’d like to see next, and if you’ve tried any of Pür Minerals other products before! Have you used the Dirty Girl Masque? What’s your favorite? Thanks again lovelies, and have a beautiful (like you) day! How did the results compare to Glam Glow?